Majestic 37-1505 Dyneema gloves features a gray shell made with Dyneema Diamond Technology. These gloves are perfect for industrial applications with the ideal combination of dexterity and durability. 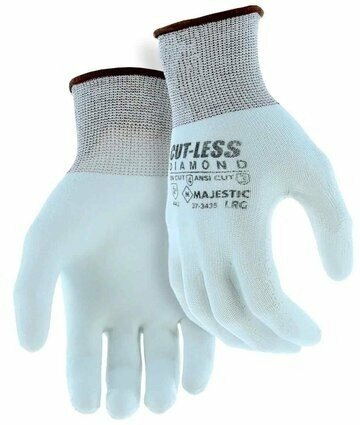 Majestic gloves made with Diamond Dyneema offers the leading combination of cut protection, comfort and durability. At pound-for-pound fifteen times stronger than steel, Dyneema is the world's strongest fiber. High performance 3G12 made with Diamond Dyneema Technology/Spandex. Gray polyurethane palm coating for industrial applications. Long knit cuff for more secure fit. Pre-curved finger design to minimize hand fatigue. Cut level - CE 5/ANSI 4.